A woman sitting on her knees is helping another woman, who is holding a sash, to put on a kimono. The sash will be used to tie the kimono together, after which the obi can be applied. The ancestor of the kimono was born during the 8th century when Chinese clothing with overlapping collars was introduced to Japan from China. This type of clothing became more and more stylized during the Heian Period (794–1192), until the obi was introduced during the Muromachi Period (1392-1573). The long sleeves, that are now such a signifying aspect of the Japanese kimono, became popular during the Edo Period (1603-1868), especially among single women. At the same time the width of the obi increased giving the kimono pretty much the look that it still has today. 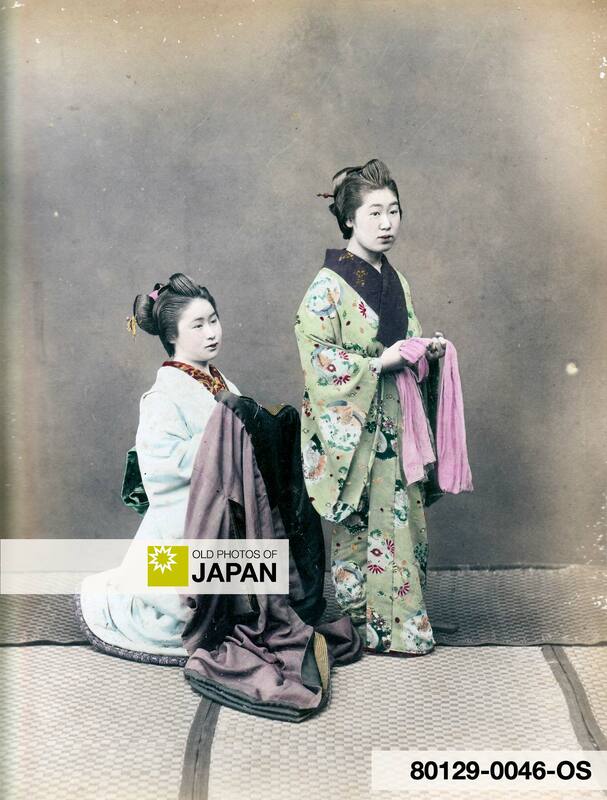 Even the kimono that the woman wears in this image, taken more than a century ago, barely differs from modern kimono. While men were encouraged to wear Western clothes as early as 1871 (Meiji 5), Japanese women continued to wear kimono and other traditional clothing through most of the first half of the 20th century. The seeds for the end of the kimono’s reign were sown during the 1920s and 1930s, when children started to wear the then very fashionable sailor suits introduced from the West. Having grown up with Western clothing, these children naturally often ended up discarding the kimono as everyday wear. This trend was hastened by World War II and the developments after the end of the war. 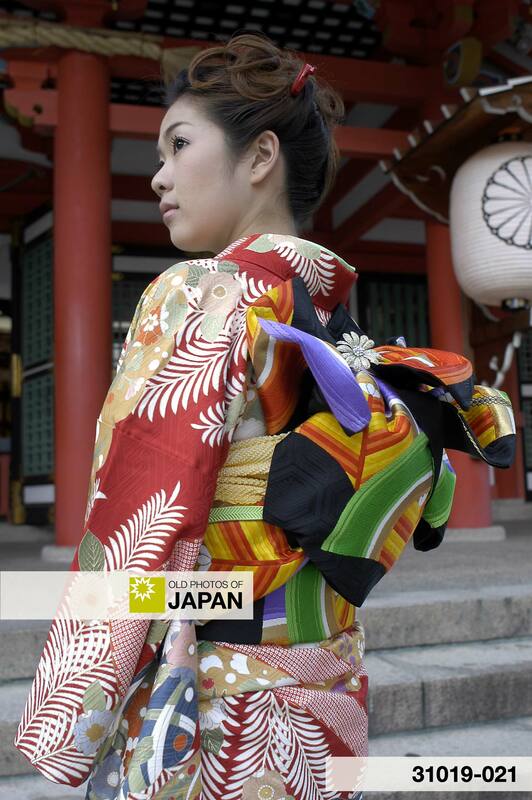 During the second half of the 20th century kimono were worn mostly during ceremonies, like weddings and funerals. During the past few years, however, an increasing number of young women have started wearing kimono again as everyday wear. Some trendsetters have even begun experimenting again with the kimono, re-igniting the creative forces that gave birth to this magnificent garment in the first place. This offers hope that the kimono may play a larger role again in Japanese fashion, although it will never again reign as supreme as it once did. You can also licence this image online: 80129-0046 @ MeijiShowa.com.